The transplanted Southerners’ interest in preserving the Confederate memorial found a receptive audience in the 20th-century North. While Confederate monuments were being erected throughout the South in the late-19th and early 20th centuries, Civil War monuments were also part of a Northern landscape that aspired to unify the once-divided nation. When the Greenlawn memorial was erected by the federal government in 1909, it was part of a national reconciliation over the legacy of the rebellion that commemorated the foot soldiers of the former Confederacy. The Confederate cause would be largely forgiven by the generation that had grown up after the war, and monuments dotting the South and North alike publicly confirmed a national reconciliation. Yet that forgiveness emerged from a nation committed to Jim Crow segregation, and monuments like the Greenlawn memorial aspired to reconcile and unify the White nation that had waged a civil war a half-century before. A century later the Greenlawn memorial illuminates the ways the Confederate monumental landscape has long distorted Southern heritage and leveraged Confederate mortality in the service of White nationalism. Indianapolis’ early 20th-century Confederate preservationists were part of a nationwide resurgence of regional Southern pride. Perhaps the best-known defenders of Southern heritage were the Ladies Memorial Associations that emerged after the war. In the wake of defeat, these Southerners set to work preserving Confederate cemeteries and erecting monuments to the Lost Cause. By the late-19th century they were joined by allies like the United Confederate Veterans (UCV, created in 1889), the United Daughters of the Confederacy (UDC, 1894), and the Sons of Confederate Veterans (SCV, 1896) who collectively crafted an unapologetic revisionist history of the Confederacy. A similar movement in the North was the Southern fraternal organization composed of expatriate Confederates and subsequent Southern migrants. In November, 1869 the Terre Haute Daily Express reported on the rumors of a “`Southern Club’ in New York, many of whose members bore a conspicuous part in the `late unpleasantness.’” A group known as the Virginia Society formed in Chicago in 1879, among the earliest of a wave of organizations that aspired to celebrate Southern culture in the postwar North. Declining regional animosities fueled the growth of comparable Southern associations throughout the North, of which the most prominent was the New York Southern Society, which formed in 1886 and did not disband until 1975. Southern Society expatriates tended to look to George Washington and Thomas Jefferson for their Southern heritage and circumspectly invoked the pantheon of Confederate heroes who were being romanticized in Southern statuary. In 1912, for instance, the Washington DC Southern Society banquet offered speeches in honor of Washington, Jefferson, and Southern women. In 1903 the cover for the New York Southern Society’s banquet included pictures of Washington and Lee alongside each other; the 1910-1911 Yearbook crowded Jefferson, James Madison, Andrew Jackson, James Polk, Andrew Johnson, Zachary Taylor, John Tyler, and James “Munroe” around Washington. Ideologues in organizations like the UCV and the UDC were significantly more committed to a revisionist Confederate history than most of the Southern Society fraternal members. In June 1916 the Indianapolis News reported on the formation of a new “Southern Club.” At the club’s first meeting about 100 new members had a program of “plantation stories and songs” while an orchestra played throughout the evening at the Hotel English. The club held a host of rather prosaic events like the March 1917 meeting: “The program to be given Friday evening by the Southern Club in the green parlors of the Y. W. C. A. will Include a song, `Old Romance’ by Mrs. Glenn Friermood, followed by Mrs. J. F. Edwards’s original sketch, `In Candle Lightin’ Time’’’ (Mrs. Edwards’ original story borrowed the title of a 1901 volume by African-American writer Paul Laurence Dunbar). 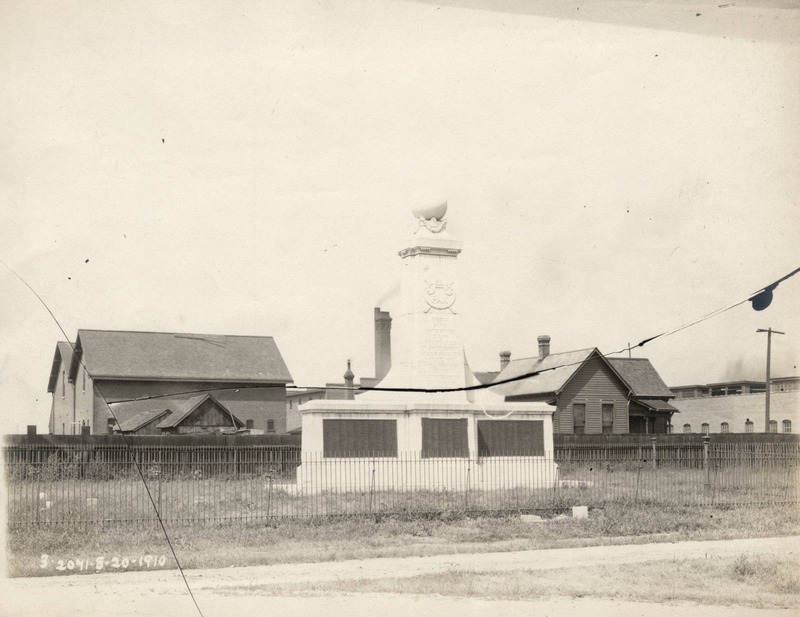 An August 20, 1910 image of the newly erected Confederate memorial in Greenlawn Cemetery included industries and railroad lines that were crossing the former cemetery (image National Archives and Records Administration, Indiana Historical Society). This was the same group as the 1919 “Southern Society” that aspired to preserve the Greenlawn Cemetery memorial, an initiative the Southern Club first announced at the 1918 Memorial Day ceremonies. Lawyer William T. Young was the Southern Club’s President, and the Treasurer was Edward Troy, both of whom would be officers of the Southern Society in 1919. The son of a Confederate veteran, Young spoke at the Greenlawn memorial in 1919 in a joint ceremony with the Grand Army of the Republic, whose representative commemorated the Union military dead. In 1918 Eugene Saunders Fisher was President of the Southern Club, and a year later he was identified as the President of Indianapolis’ Southern Society. Born in Tennessee in 1868, Fisher came to Indianapolis in about 1915 and was a manager for the Fruit Dispatch Company in 1919. Born in Kentucky in 1850, David T. Praigg became an Indianapolis newspaperman in the late-19th century and would serve as President of the Southern club twice. An 1862 image of Camp Morton (Library of Congress Prints and Photographs Division). On February 22nd the Indiana State Sentinel reported that the first 2398 prisoners had arrived in Indianapolis. 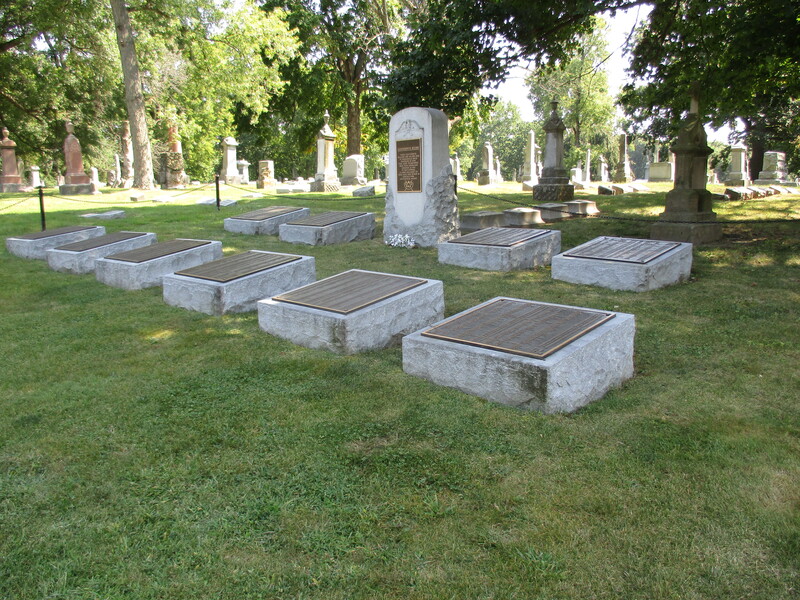 On February 26th—four days after the first captured Confederates arrived in Indianapolis—Governor Oliver Morton had purchased a lot in the City Cemetery (subsequently known as Greenlawn Cemetery) for the burial of dead prisoners: “Each man will be decently buried, the grave marked with his name and other inscriptions requisite to the designation of his remains to his friends hereafter.” Three prisoners had died the day before: possibly the first deaths in Camp Morton had come with the February 25th deaths of Mississippi 26th Regiment (Company K) Private John Pinkston, 4th Regiment Mississippi Infantry Private Jesse Evans, and a Kentucky soldier identified as James Leville of the 8th Kentucky. An unidentified soldier died a day later, and the next day witnessed the deaths of two more members of the 4th Mississippi, A.J. Gentry and Malcom Afford, and a 53rd Tennessee soldier, Samuel Cashion. An African-American captive identified as “Little Toe” died March 2nd, one of a handful of captives who would die and end up interred with the Confederates fighting to preserve their enslavement. On March 1st the Richmond Palladium reported that six Confederate prisoners were dying each day. By April 5th, 163 Confederate prisoners had died in Camp Morton, including 24 during the week ending on April 5th. Teams of prisoners placed the Camp Morton dead in wooden caskets that sat alongside each other in 20-foot trenches. Indianapolis undertaker Charles Williams was hired to handle family claims on Confederate burials, and he assembled a list of dead prisoners that was printed in various Southern newspapers identifying the Camp Morton dead (e.g., Louisiana dead appeared in February, 1866 in New Orleans’ The Times Democrat). An 1868 inspection concluded that 1556 Confederate prisoners were buried in Greenlawn, and a modest but unknown number of bodies were claimed by family members in the wake of the war. In 1914 Confederate Veteran included an inventory of the former prisoners believed to have been buried at Greenlawn, but the inventories of prisoners who died at Camp Morton and were buried at Greenlawn were inevitably unreliable. Many prisoners’ bodies may not have been laid to rest at the Confederate memorial’s location: In 1870 a railroad secured the original tract containing the Confederates’ resting places, and the bodies were moved to another section of the cemetery. 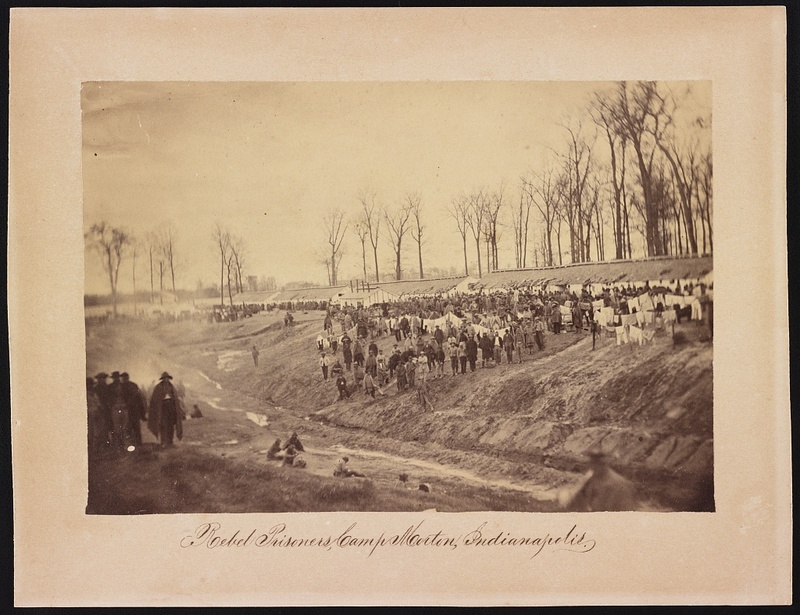 The prisoners began to be exhumed on May 11, 1870, to be “placed in new boxes and numbered so that they can be identified at any time.” A week later about 300 of an estimated 1564 bodies had been disinterred, but re-burial was in disordered trenches without any markers, and almost certainly not all of the burials were moved to the new tract. By 1898 Memorial Day ceremonies had begun to include the Confederate graves at Greenlawn, and throughout the early 20th century the Confederate dead at Greenlawn were part of the city’s Memorial Day ceremonies. The tone of forgiveness was sounded in the 1904 ceremonies at Greenlawn when a speaker argued that the rebels and the Greenlawn Confederate dead “fought valiantly, bravely and well for what they had been taught to believe was the only hope of their future independence; remembrance that to them the Union soldiers were invaders, bringing death and destruction to their very door; that in deeds of valor, in self-sacrifice, they were not behind their brethren of the North; that these were not cut-throats nor marauders, but honest, upright, loyal-hearted and, in many instances, pure, noble-minded Christian men, moved by the strongest sense of duty to battle for the right as God gave them to see it.” Confederate veterans and their descendants became part of yearly commemorations (for example, in 1909, 1922, and 1923) that sounded similar notes of reconciliation. In 1925 the Indianapolis Star reported that a Confederate veteran they identified as J.W. Price appeared at the Memorial Day ceremonies and commented that “We are one today.” This probably was William James Price, a Georgia-born traveling minister who had indeed served in the Confederate Army (though it is not clear that he served under Stonewall Jackson, as the Star indicated). A 1916 map identified Greenlawn as “condemned,” though the POW graves and Confederate memorial remained on the gorunds. Greenlawn fell out of use by the early 1890s and became administered by the Parks Department in 1892, when most civilian burials began to be moved to Crown Hill Cemetery. However, the Confederate burials remained in Greenlawn. In 1906 federal legislation was passed creating a Commission for Marking Graves of Confederate Dead, and the commission was charged with erecting permanent individual markers at Confederate graves like those in Greenlawn. By March, 1910 the Commission reported that it had erected 8845 individual markers to Confederate dead, but in many cemeteries individual dead could not be reliably identified. This was the case at Greenlawn, where the Commission found in 1906 that there was not any agreement on where the Confederate graves were even located. After lengthy interviews, documentary research, and inspection of Greenlawn, the commission determined they had located the plot to which the buried rebels had been moved in 1870 (though the commission acknowledged that the exhumations had certainly not moved all of the original burials). In 1912 the Commission also placed a marker to 11 Confederate prisoners who were buried in Terre Haute’s Woodlawn Cemetery. In October 1908 Confederate veteran and former Alabama Congressman William Oates petitioned the President and Secretary of War to appropriate $200,000 for the erection of a Confederate memorial at Greenlawn. Oates visited Greenlawn in his role directing the federal effort to mark Confederate graves, and he found that identifying individual graves at Greenlawn was impossible because the original wooden markers had long ago decayed. 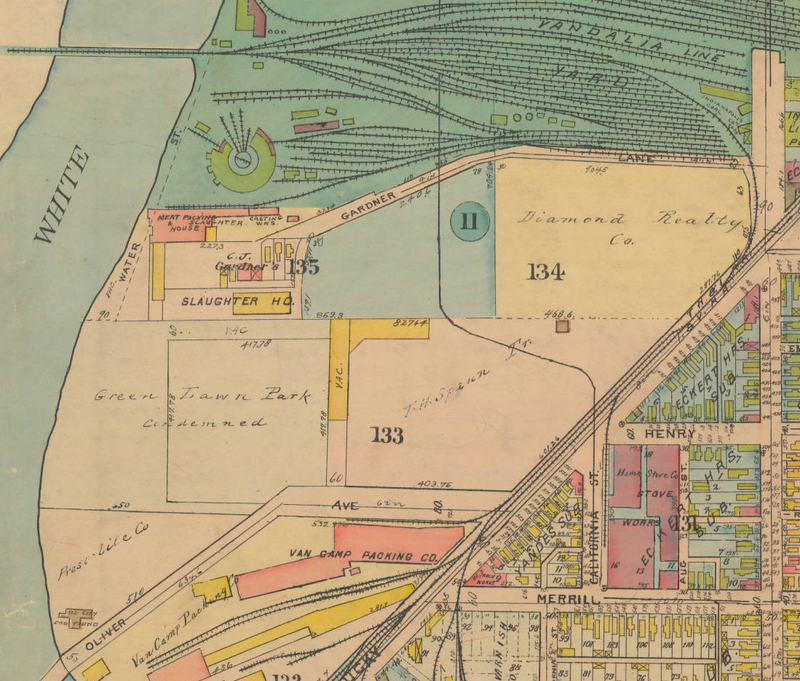 The 1870 railroad right-of-way had been extended into Greenlawn, and Oates concluded that only a scatter of burials had been properly exhumed. Oates recommended that rather than place individual markers as the legislation directed, Greenlawn should receive a single marker. The memorial included the names of prisoners who had died in captivity and were believed to be buried at the Greenlawn memorial (image National Archives and Records Administration, Indiana Historical Society). In January, 1909 the Indianapolis News reported that funding for a memorial had been approved, with a call for designs outlining a 20- to 30-foot high marker to be made of marble or granite and costing no more than $6000. By September, the Van Amringe Granite Company had secured the contract for the monument (they also were constructing a similar memorial for the graves of 2436 Confederate prisoners buried in Finn’s Point Cemetery in New Jersey as well as one for the North Alton, Illinois Confederate Cemetery, and eventually they also built a memorial to Confederate dead at Point Lookout, Maryland). 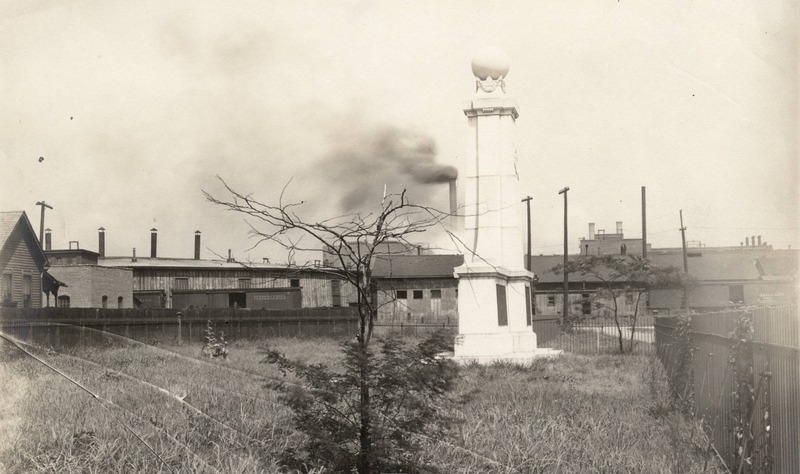 The Greenlawn monument was being readied in September and on October 9, 1909 the Indianapolis News included an image of the monument being placed in Greenlawn. The next day the Indianapolis Star reported that the foundation for the monument had been completed. A close-up of the plaques on the Garfield Park monument today. In May, 1919 Military Park appeared to be the leading candidate for the Confederate memorial. Garfield Park had not been mentioned as a possible place to relocate the Confederate memorial, but in June 1919 Garfield Park was recommended for the memorial’s relocation. Nevertheless, by 1921 the Confederate Memorial was engulfed in weeds and refuse alongside railroad tracks and industrial spaces, and in November, 1921 a Congessional bill once again proposed funding the exhumation of Confederate burials at Greenlawn, moving them and the memorial to Crown Hill. Yet in March, 1923 the Congressional bill to move the Confederate memorial died in committee. The Southern Club remained committed to legislation moving the Confederate memorial, and in 1928 Congress passed a bill approving its removal to Garfield Park. The following Memorial Day the Southern Club held its first commemoration of the Confederate war dead at the memorial’s new location in Garfield Park. Yet the Confederate war dead themselves remained buried at the former Greenlawn Cemetery, and the Southern Club believed the prisoners should remain buried there. Eugene Fisher argued in August, 1931 that reburial was akin to “sacrilege,” and he recognized the practical challenges of identifying Confederate dead or distinguishing them from the civilians who had been buried around them. Nevertheless, the War Department approved the exhumation of the prisoners in September, 1931. In December, 1931 the New York Herald Tribune reported that 1616 unidentified Confederate prisoners’ corpses (and, by their account, 22 imprisoned sympathizers) had been moved to Crown Hill. The Southern Club’s reluctance to move the prisoners’ bodies along with the memorial illuminates the contradictions of the Garfield Park monument. 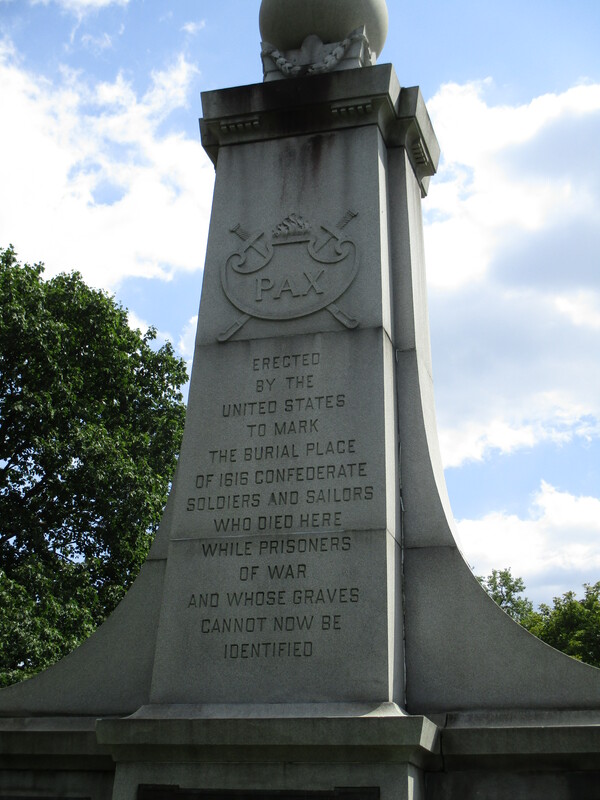 The memorial’s placement in Greenlawn in 1909 cast it as a grave marker, and if the memorial had been left in Greenlawn Cemetery (or moved to Crown Hill) it is unlikely that it would now be the target of anti-Confederate uneasiness. Still, the memorial was never simply a grave marker: in 1909 it was part of a national concession of the valor of Confederate soldiers, a maneuver that attempted to rationalize their deaths but evaded their service to a rebellion. The reconciliation posed by such memorials was between White Northern and Southern citizens, and while it did not glorify the Confederacy it was squarely situated within a historical moment when the federal government was increasingly disinterested in patrolling the segregated South. Moving the monument to Garfield Park lent it a somewhat distinctive status in the universe of Confederate monuments: its’ heritage was as a memorial to dead Confederate foot soldiers, but in Garfield Park it was a public acknowledgement of the Southern cause erected on behalf of the nation and then granted space in the name of the city itself. Placing the monument in Garfield Park ensured the marker continued to be a magnet for memorialization of the Confederacy, not simply the soldiers who died in Camp Morton. 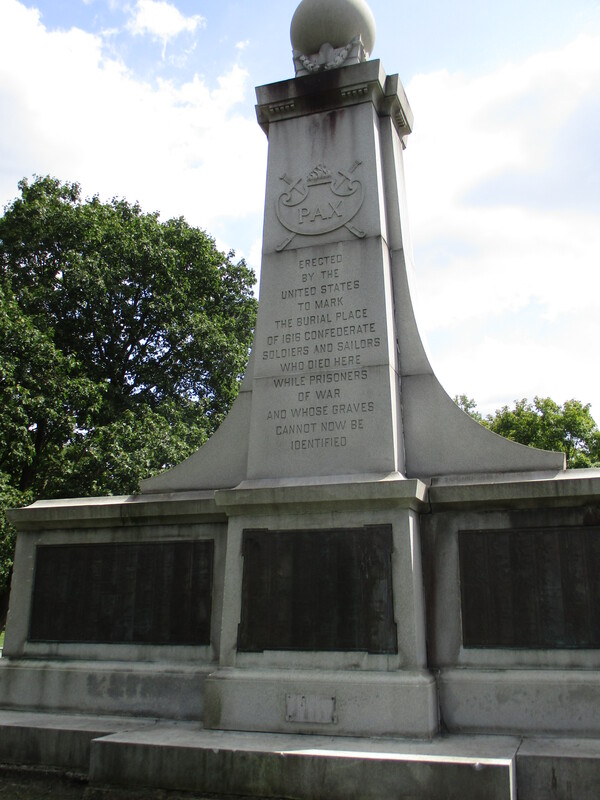 In 2014 the Sons of Confederate Veterans began fundraising to preserve the Garfield Park monument (Indianapolis is today home to one of seven SCV camps in Indiana). The acknowledgment of the Confederate monument preservation registered some ripples of discontent as well as lingering anti-Union bitterness a century-and-a-half after surrender. In 2014 a local preservationist with the conservative Indiana Policy Review sounded the shallow complaint dear to neo-Confederates, arguing that the apparent “move to purge the American landscape and American culture of any public memory of the Confederacy and those who fought on its behalf is part of what may be called the `airbrush history movement,’ modeled on the Stalinist practice of airbrushing from photos the images of purged comrades and rewriting official Soviet history.” This hackneyed defense of Confederate public spaces fails to grasp that the memorial is part of history-making rather than history itself, and much of that Confederate heritage construction has come under increasingly resolute attack. There was little apparent interest in the Garfield Park monument until cities like New Orleans resolved to dismantle their Confederate monumental landscape. 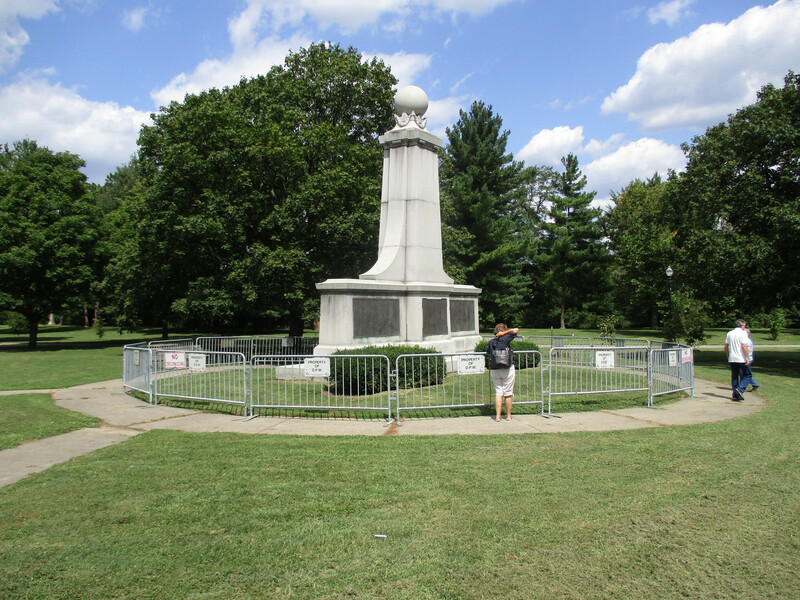 In August a protestor attacked the Garfield Park monument with a hammer, and Indy Parks surrounded it with fencing as the City-County Council indicated that they would consider the monument’s ultimate fate. A host of neo-Confederates have now rallied around the monument, with one person bringing his AK-47 to a vigil protecting the memorial. The monument is a fascinating testament to the mechanics of Confederate history-making, yet it escapes much critical attention because it invokes foot soldiers rather than ideologues or the rebel cause. Destroying it will not “erase” Civil War histories, but until the monument offers a reconciliation that reaches beyond a segregated nation it can only be an unpleasant testament to the Confederate cause. 2010 The Great Task Remaining Before Us: Reconstruction as America’s Continuing Civil War. Fordham University Press, New York. 2016 Federal Stewardship of Confederate Dead. U.S. Department of Veterans Affairs, Washington, D.C.
1996 The Afterlife of Civil War Prisons and Their Dead. PhD Dissertation, University of Oregon. 2010 New South Nation: Woodrow Wilson’s Generation and the Rise of the South, 1884-1920. PhD Dissertation, Yale University. 1987 Southern Fraternal Organizations in the North. The Journal of Southern History 53(4): 587–612. 1988 The Confederate Carpetbaggers. Louisiana State University, Baton Rouge. Posted on August 28, 2017, in Uncategorized and tagged civil war, Garfield Park, monuments. Bookmark the permalink. 1 Comment. All monuments are based on memory and cultural values both which change through time. Thus, monuments have a life span (or a short useful life), Some monument life spans are longer than others. When the life span of a monument is done the monument needs to be removed from the primary public arena (where individuals do not have to view it every day) and placed in a secondary public arena (such as a museum). Confederate monuments served their pupose and monuments today all need to tell an entire cultural story and not just a segment of it.